United States Senator Sherrod Brown (D, OH) has been a long-time advocate for the school lunch program in Ohio and across the country. He is currently trying to expand summer feeding to reach more children in need. Brown is also advocating for school meals abroad as an important piece of U.S. foreign policy. The News Record reported on Brown’s recent visit to Haiti. There the Senator saw the impact of school meals, funded by the US McGovern-Dole program, on Haitian children. Named after former Senators George McGovern and Bob Dole, this program funds school meals in developing countries. The UN World Food Programme (WFP) received the McGovern-Dole grant for Haiti and distributes the food. Elizabeth Jennings of WFP says the McGovern-Dole funding “has been vital” in supporting school feeding in Haiti. WFP relies on voluntary funding for its hunger relief programs in Haiti and other countries. These programs often face low funding levels. 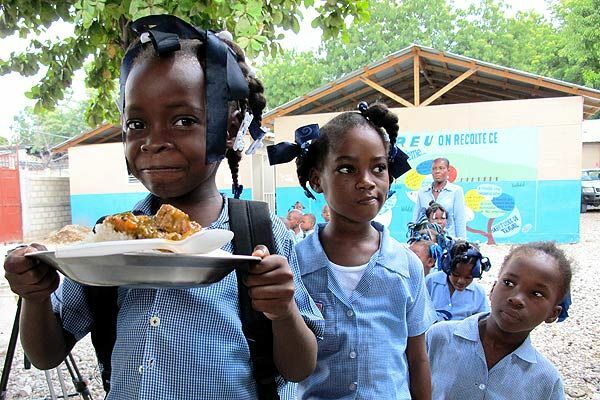 The McGovern-Dole grant has allowed WFP to feed about 300,000 Haitian children. For many children in developing countries, school feeding might be the only meal they receive the entire day. McGovern-Dole funding allows millions of children in Haiti, Afghanistan, Mali and other countries to get food for education. Senator Brown is urging that the U.S. continue to fund McGovern-Dole and other food aid programs. Article first published as Senator Brown Urges School Meals at Home and Abroad on Blogcritics.